There are probably a hundred ways to make taco salad. This is just one version I serve my family and I think it's delicious! And it's a cinch, too, because I cook the chicken in the slow cooker. Easy peasy!!!! Place 3 chicken breasts in the slow cooker that's been sprayed with nonstick spray. Sprinkle taco seasoning mix on top of each chicken breast, add 1/4 cup water, and cook on low 7 hours or high 4 hours. When done, remove from slow cooker and shred with a fork. Then pile your plate with chopped lettuce, seasoned chicken, cheese, tomatoes, avocado, cilantro, jalapeños (feel free to use fresh if you want, too!!! ), sour cream, salsa, crushed tortilla chips, and squeeze the lime on top. So SO good!!! Whatever toppings each family member loves most will make each plate so tasty. Tip: Make sure you have all ingredients chopped beforehand so that when it comes time to eat it's all just a matter of piling it all up on your plate. YUM!!! Yum! That looks amazing. :-) My husband has been trying to stay low on carbs, so we will definitely have to try this soon. we make a lot of taco salads around here, but I never thought about using chicken. great idea! This looks delicious! I love hearing about new ways to make things. Thanks for sharing the recipe on Foodie Friday! I love that I can eat this without bread! My family is big veggie eaters so this will settle just right. This sounds yummy and healthy! Thanks for linking up at Friday Frenzy Link Party! Pinned!! OH man I love taco Salad!! Pinned it! Thanks for linking up to the Friday Frenzy. Your Chicken Taco Salad looks delicious! Hope you are having a great day and thanks so much for sharing with us at Full Plate Thursday and come back to see us real soon! 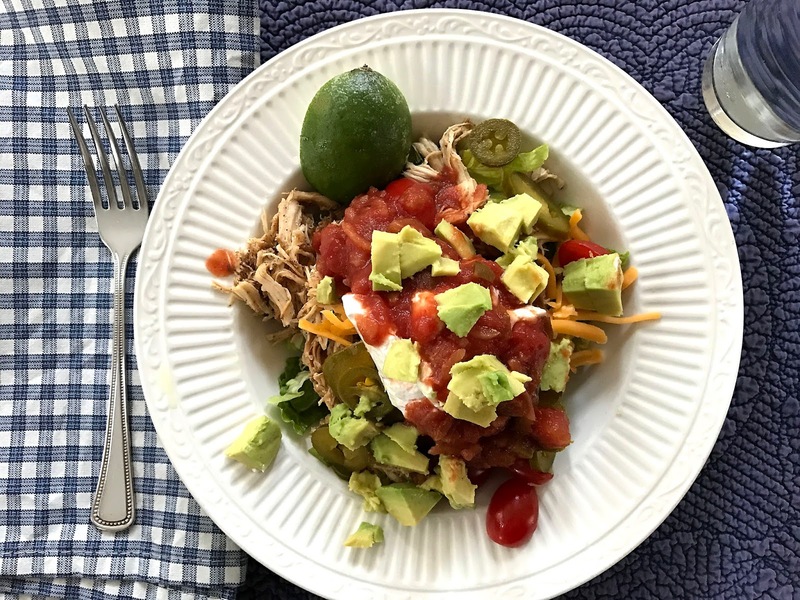 I love taco salad and this looks delicious! Thanks for linking up to the Friday Frenzy!